The Parametric Optical Design Tools within Photopia™ and Photopia for SOLIDWORKS® streamline the design process and help you create world class optical designs in a fraction of the time. 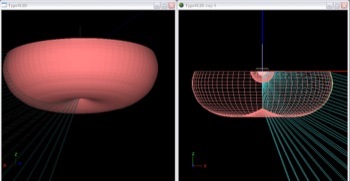 The Parametric Optical Design Tools use profiles to drive the generation of 3D optical geometry. A profile is defined by key parameters like the light source location, the size, and the aiming of light. Then these profiles can be used to create a 3D part, using a simple extrusion or revolution, or by creating a complex lofting and linking of multiple reflector profiles. 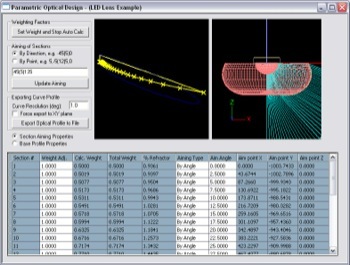 Profiles can be adjusted via aiming angles (parabolic sections) or aiming points (elliptic sections) with either a weight equation for smooth transitions, or via individual weights on each aiming section for precise control. 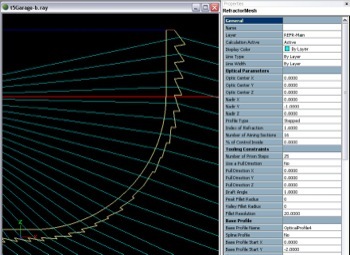 The starting profile gets you well on your way to a final design, and all of the adjustment parameters allow you to quickly iterate to an optimal design without having to redraw or import CAD models. 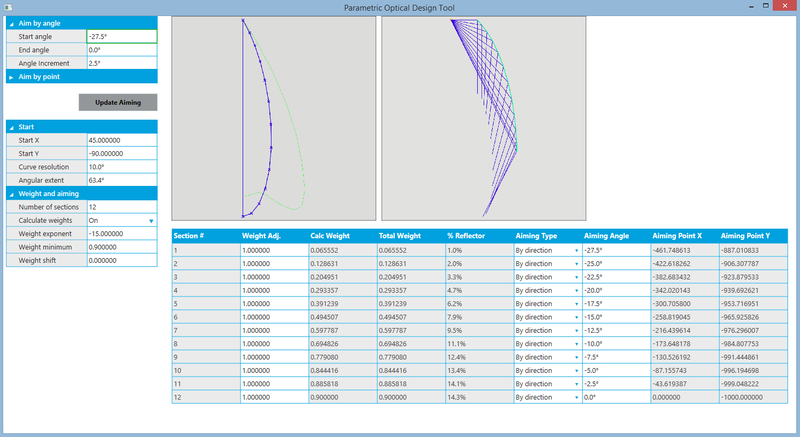 Based on our experience and customer feedback, the Parametric Optical Design Tools can save you hundreds of hours on a design. 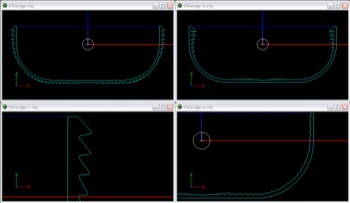 Within SOLIDWORKS, the Parametric Optical Design Tools are used to create profiles in your 2D sketches. You can then use the 3D creation features of SOLIDWORKS to generate your full optical part. 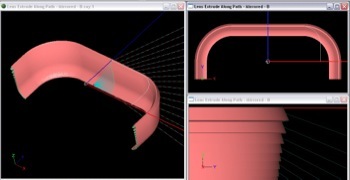 Create extruded or revolved parts, or more complicated lofted surfaces. You can union and subtract other features, such as flanges, holes, or other mounting features. Iterating and optimizing your design is easy since you only need to change the root optical sketch, and all of the down-tree features will be reapplied to create your final 3D optic part. 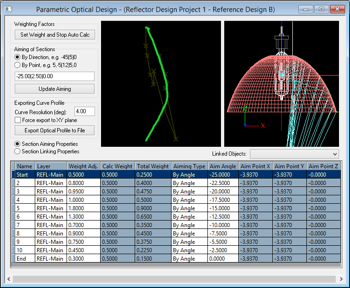 Whether you're working on a downlight reflector, an extruded indoor lens, or an injection molded LED Roadway lens, the Parametric Optical Design Tools can help you create geometry based on where you want to aim the light. In Photopia you'll create the full 3D geometry of the part. 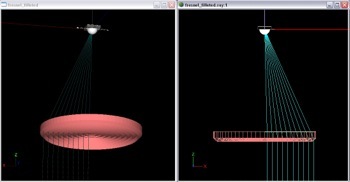 The Parametric Optical Design Tools allow you to create reflectors and lenses based on how you want to aim the light. The Optical Design View provides an interactive place where you can adjust the aiming of each section. We make use of weighting factors, so it is simple to adjust how much light is going in each direction. Have a little too much light directly below, just adjust the weighting factor. Want to kick more light at 70 degrees, just add some sections aimed in that direction. 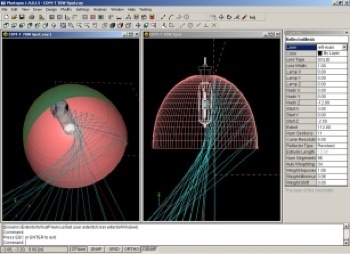 The Parametric Optical Design Tools are a component of Photopia and Photopia for SOLIDWORKS. For more information about pricing, purchases, or trials, please visit our pages for Photopia and Photopia for SOLIDWORKS.